As with all software, continuous maintenance of WordPress websites is essential if you want a properly functioning and engaging website. By avoiding website maintenance tasks, you are doing the equivalent of forgetting to change the car oil. For those who prefer more environmentally friendly examples, try leaving your bike chain unoiled or forgetting to polish your shoes. Car, bike, and shoes will work less efficiently, and not look that great, either. Naturally, this applies to company websites. When not properly maintained, how can you be sure potential or existing customers can access it? And why would they want to, if they’ve already seen the basic, boring, static and ugly website before? No-one wants a rusty car.Especially when given their pick of better, shiny, cutting-edge vehicles. If you do not perform (at minimum) monthly maintenance on your WordPress website(s), you are pouring money down the drain. Website visitors are used to rapid response, the latest technology, one-click communication, and lots and lots of eye candy. How many website owners actually take the time to visit their own website? Go ahead. How does your site compare to that of your competitors? If you find it slow, clumsy and boring, so will the rest of the world. Does each page load quickly? Are any of the links broken? Does your site function when accessed from a smartphone or tablet? Is the site even online? Website malfunctions, in the worst case scenario a website that is offline for any amount of time, can cost you a lot of money. Website performance, loading times and online and offline times are very much dependent on WordPress software and installed plugin performance and versions. In addition to this, website content, branding, design, and updates should be constantly monitored, reviewed and updated; by implementing different metrics, you can monitor various statistics such as online availability. When hiring a professional, all the latest updates can be added without any downtime, meaning your visitors are guaranteed a user-friendly site where fresh information is continuously available. In other words, a professional website developer will create a magazine your visitors (and potential customers) add to their bookmarks, or download as apps. This is what customer retention is all about. Of course, this task might be carried out by a member of your own staff. Just make sure they are aware of the latest trends and know enough code to turn your website into a unique experience instead of a cookie-cutter replica of a competitor site. They will need time to carry out these tasks and will have to pass previous tasks to their colleagues. Most websites developers have a clear maintenance process, starting with the creation of a back-up. After every update, a professional service will make sure changes have not affected the user experience (or UX) in a negative light. Most agencies will implement software which automatically keeps track of which plugins have been or need to be updated, and can then restore an earlier version if the most recent has been infected with bugs. Reputable web developers will also offer monthly reports which deal with website security issues, performance, and other analytics. All problems will be immediately fixed, often without your ever noticing, they were there. It’s easy (and free) to install WordPress. However, maintaining a WordPress website is not a low-cost undertaking. If you run generic admin updates from WordPress, no backups will be made; any bugs which develop over the following days, weeks or months will be very difficult to trace, while returning to a previous version might mean losing important data, such as recent content updates, new client details, and orders. Much of this data loss will lead to significant financial losses. Of course, paying someone to do what many say is a simple task might seem over the top. Many website owners ask friends with WordPress knowledge to take over site maintenance until the business has grown, or let someone from admin take over for a few weeks to ‘seehow it goes’. But let’s face it when faced with a butcher, a baker, and a candlestick maker, which of them is going to make the most impressive, show-stopping wedding cake that everyone talks about and wants to take a bite out of? Inexperience and neglect can significantly damage the appearance and functionality of your WordPress website. The moment your website stops behaving as a high quality website should, it’s time to make a decision. 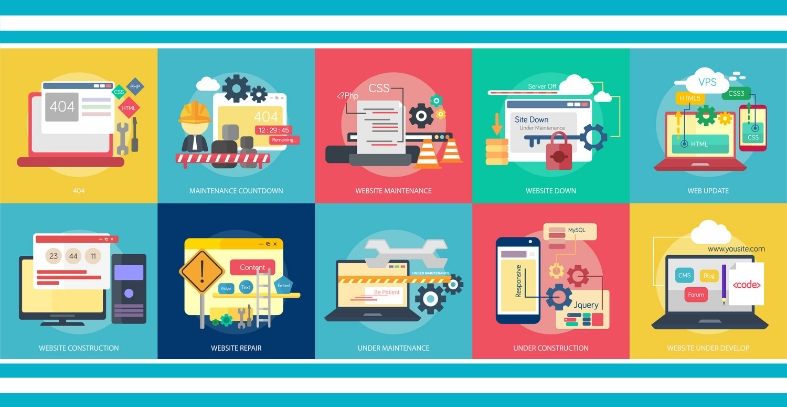 Web owners can either try to fix it themselves, with the risk that any existing problem will become significantly worse, or delve into company funds and hire an experienced professional (at a relatively high rate) to carry out repairs. Just like the previous examples of car oil, bicycle oil or unpolished shoes, preventive maintenance is a lot cheaper than repair. Unless you buy very cheap shoes. This blog happens to be on a website developer website. Of course, we want you to hire a pro. But in all honesty, which of your staff members can take on this complicated task and make your website work for you? Do they have the time to maintain, repair and update every page, every ad, every form template, and every product? Do they know what to do when it comes to fixing bugs? Are you prepared to pay for expensive niche software which automates a wide range of tasks, leaving your chosen web developer more time to make other adjustments? Or do you find someone who can do all of this, using their own collection of high powered tools and software, in a fraction of the time and with up to date knowledge of website design? In short, would you start a lawsuit without calling in a lawyer? Or get the butcher to mould the silver for a lower price when you have a professional (but more expensive) candlestick maker just around the corner? Chances are, you’ll have to pay the candlestick maker the moment you take your first look at what the butcher has created. Hiring an experienced web professional to maintain your WordPress website will prevent lost visitors, lost users, and lost profits. If your website needs an overhaul, or if your business has not yet discovered the potential profits of a well-maintained and interesting company website, get in touch with a professional. You will never regret taking the plunge. And neither will your business.